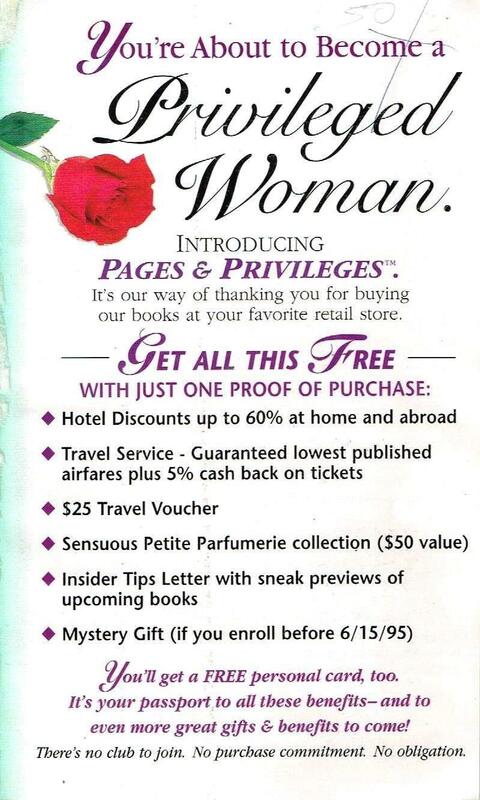 Many of the older romances I pick up, and even some of the newer ones, have mail-in cards that sign you up for a monthly book subscription. 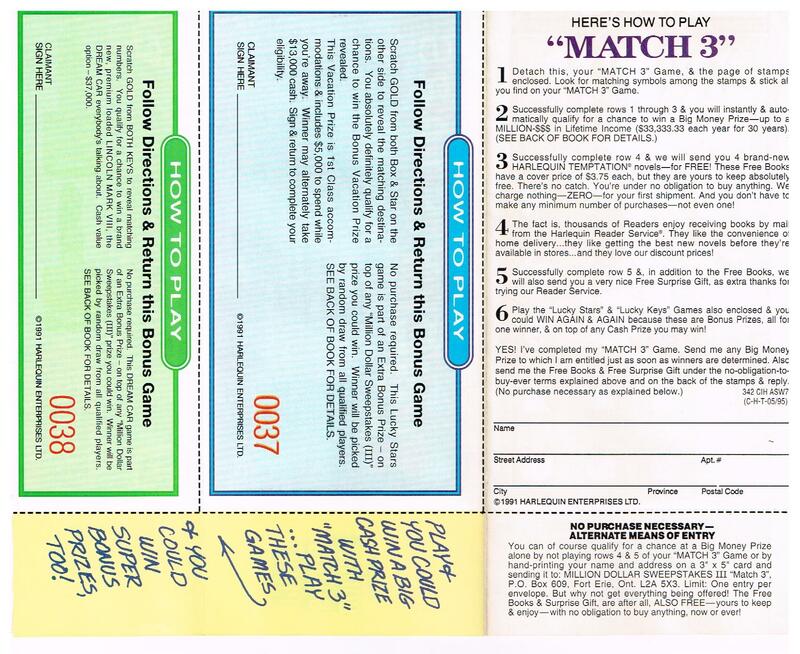 The cards usually include a gift, sometimes a contest, and always a sticker of some sort that you must remove from one page and attach to another. Presumably some unknown marketing person proved that asking people to peel off and re-attach a sticker improved response (Terry O’Reilly probably knows who it was). I photograph and paste these on twitter, to celebrate their varying degrees of cheesiness. 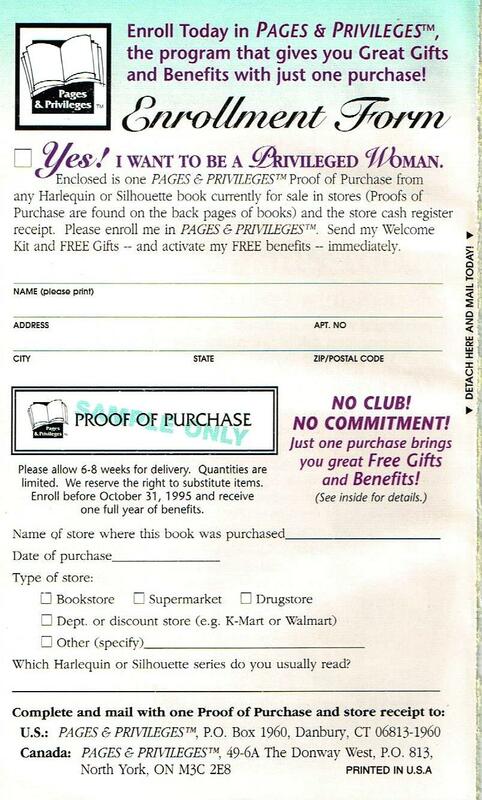 Never a Bride, a 1995 Harlequin Temptation (to be reviewed soon), had not one, but two inserts. The usual subscription offer in the middle, but with more sticker madness than usual, as well as an offer “to become a Privileged Woman,” just inside the cover. Wow. Is it just me, or is this patronizing? Even for the 1990s? “Get the kind of luxuries that, until now, you could only read about.” Because you’re too poor to stay in nice hotels, and don’t know you can get travel discounts from the auto club or any decent travel agent (showing my age, but that’s how we did discounts before the internet). “A privileged woman is always jetting to romantic places.” Because she obviously doesn’t work (notwithstanding the entrepreneurial bent of many romantic heroines). This seems to be hearkening back to the 1950s, and notions of the jet set. Also, the implication is that romantic places are far away. Some of the most romantic places I’ve ever been are just a city bus ride away, or perhaps a day trip. Then again, I do live in Nova Scotia. You don’t need to read many romance novels to learn that anywhere can be romantic, with the right partner. “Stir your senses (and his).” Spice up that marriage, ladies. And who doesn’t want “dusting powder in a satin and lace covered box.” In fairness, I love my bubble baths, but that’s for my pleasure, and I don’t fuss over the container. I could get into half-price movie tickets. Just one book gets you in – for a year. I can only assume the program was not successful, since it does not appear to have lasted. But at least it was available to Canadian readers. Sure enough, the last page of the book had a page summarizing the program, and the proof of purchase. There’s a short code on it which may identify the book, or the date of the offer. One thing missing from this insert is the business reply mailer. 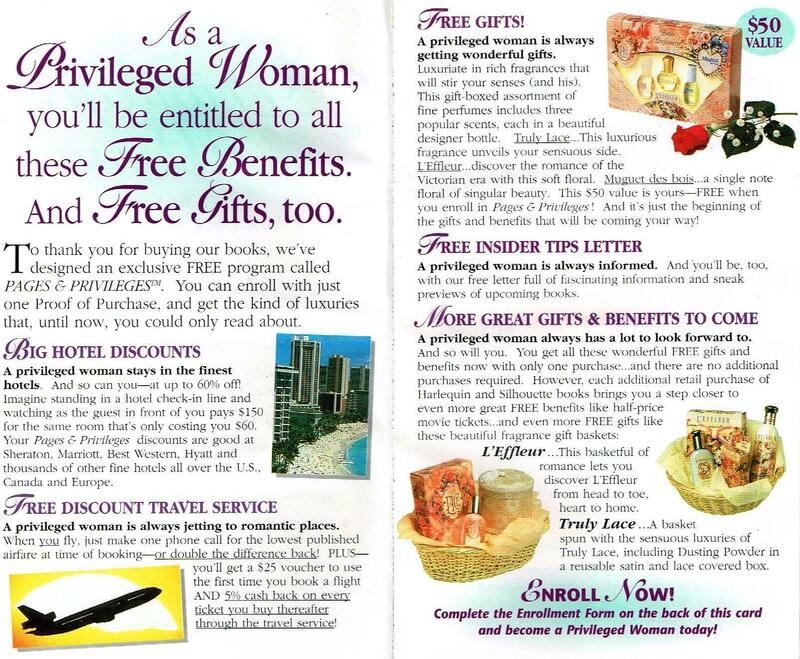 If you want to become a privileged woman, you have to supply your own envelope and stamp. There’s also no sticker to move – the proof of purchase is presumably supplied by cutting it out, or ripping out the page, and stuffing it in the envelope. That’s no fun. The lack of a sticker is more than made up for by the subscription insert. When you match a cash prize, you are “instantly” eligible. The only certain prizes are four free books and a free gift. Is it as nice a mystery gift as the privileged women get? As long as it’s not the same, I suppose that’s okay. This was a Canadian printing, so the postage paid envelope on the back of this card works, and to comply with Canadian contest laws you can enter by simply sending your name. That’s useful if you can’t be bothered to move the stickers, but then no free books for you. Although this was in a 1995 book, the copyrights are all 1991. 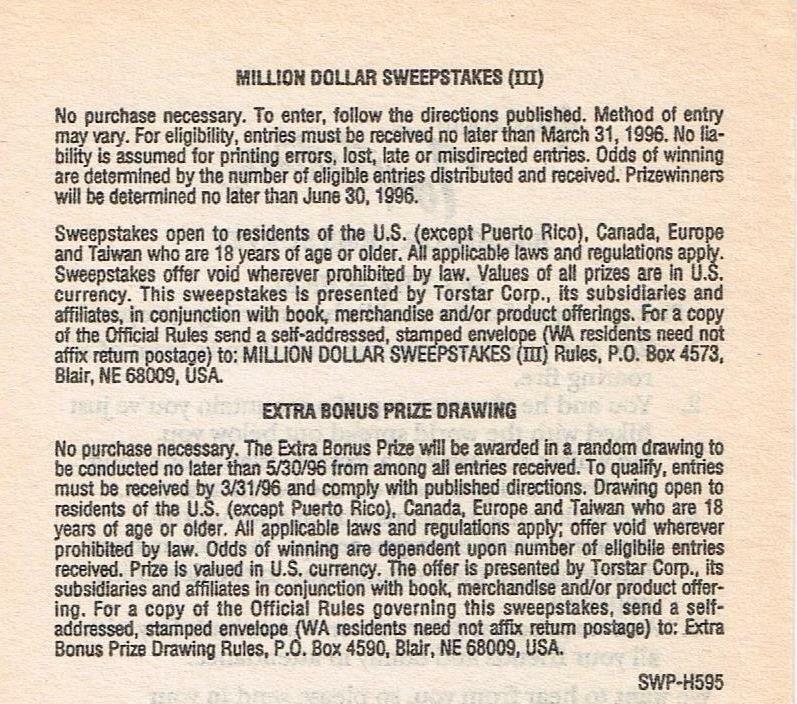 According the details in the back, the contest ran until March 31, 1996. Some entrants might have waited five years for the draw. Or they might have given the stickers to the kids, and enjoyed a happy afternoon (or at least a few minutes). As cheesy as these promotions were, perhaps they reflect the times? Maybe in a few years we’ll be nostalgic for the 1990s.